Reaver is an angel with a past, a record and a less-than-heavenly attitude. Powerful enough to fight alongside the fiercest battle angels—and crazy enough to risk his wings on a one-way mission to hell—he's agreed to go where no angel has ever gone before...to steal the most seductive and dangerous prize of Satan himself. With Satan and his army hunting our heroes, and our heroes making precious discoveries over a very old past mysteriously forgotten, the trip to Sheol can only be described as something beyond exciting! Not knowing even half of Reaver's story, but desperately wanted to (pfft, tell me about it, right Reaver? ), the whole mystery around him has made the wait almost unbearable, but definitely worthy. I admit that during the reading I figured out something by myself, but did this ruin anything? Not a thing! 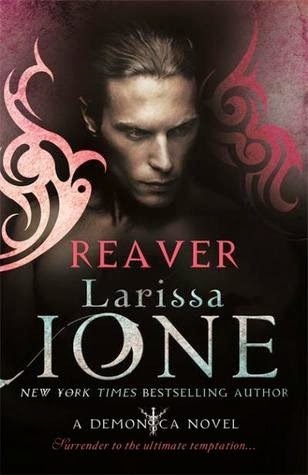 I loved what the author came up with and, truth to be told, Harvester was amazing as much as Reaver. As a matter of fact, from my point of view, she has always been a fantastic character and certainly a very interesting one. In here she simply shined! Larissa Ione caught me once again on that special emotional level I can never be tired of, but she also threw me in the middle of epic battles where action made my adrenaline run fast and wild. I can still play those events in my mind and the words that accompanied a few indelible scenes... I was craving another gorgeous instalment and Ione gave me just that!